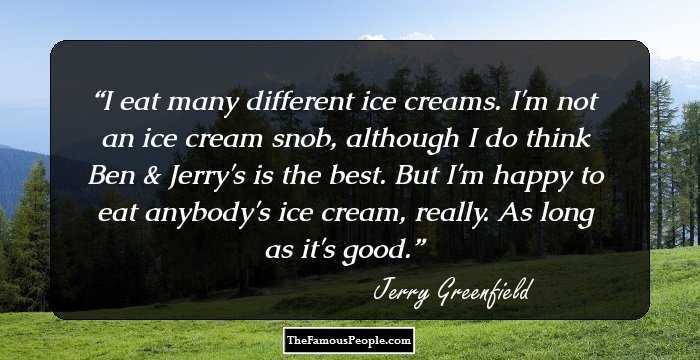 A collection of quotes and thoughts by Jerry Greenfield on ice-cream, net-worth, death, wine, whisperer, business, sayings, powerful, believe, recycling and support. 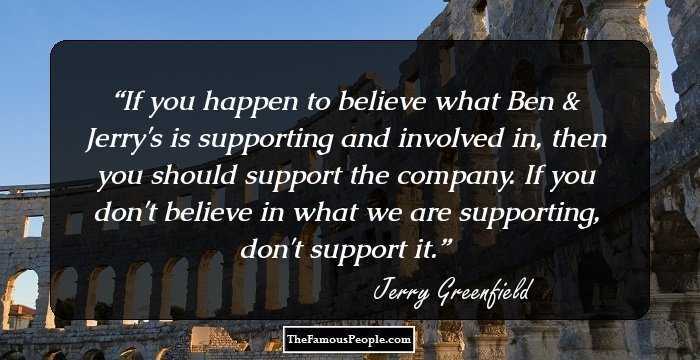 Jerry Greenfield is a famous American philanthropist and businessman. 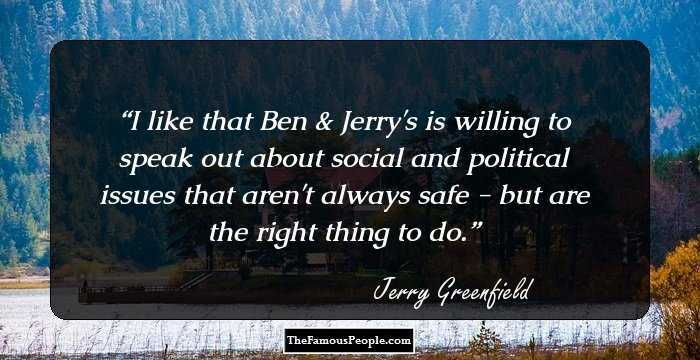 He is one of the founding fathers of ‘Ben & Jerry’s Homemade Holdings, Inc. He spent his childhood on Long Island in New York City. He graduated in 1973 from Oberlin College where he followed a pre-med curriculum. For two successive years he applied in medical school but could not get through it. It was in 1978 that he along with his friend opened the ice cream scoop shop and then there was no looking back after that. 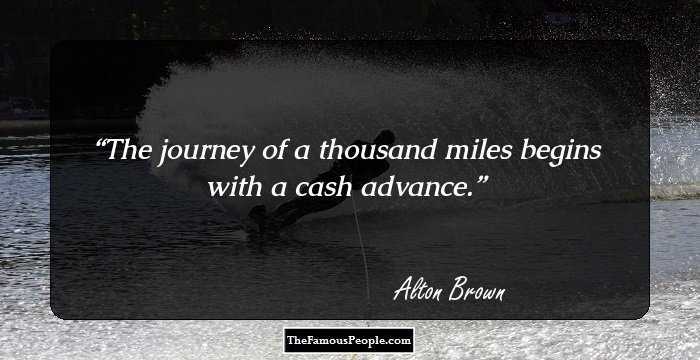 Ever since the firm has opened approximately 200 franchises and the reported earnings annually of the firm amount at around $235 million. 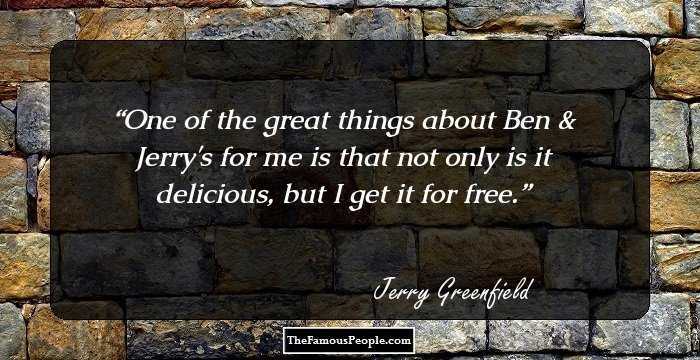 We have made a treasury of popular quotes and sayings by Jerry Greenfield that will give you a glimpse of his successful business mind. 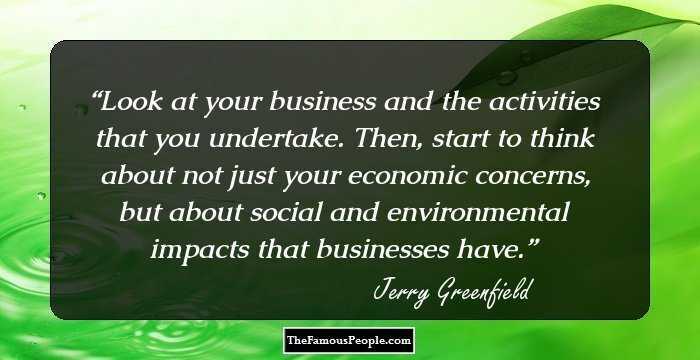 Take a look at the meaning, inspiring and famous quotes and thoughts by Jerry Greenfield on caring, environmental, quality, business, money, problem, think, profit, loss, values, cost, success, disappointed, happen, life, big, high, innovation, company, political, speak, mind etc. 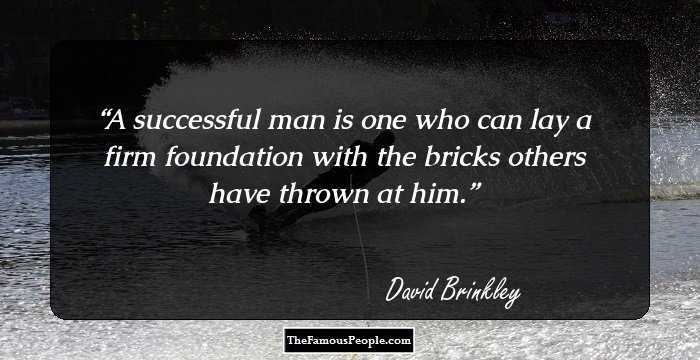 Look at your business and the activities that you undertake. Then, start to think about not just your economic concerns, but about social and environmental impacts that businesses have. If you happen to believe what Ben & Jerry's is supporting and involved in, then you should support the company. If you don't believe in what we are supporting, don't support it. 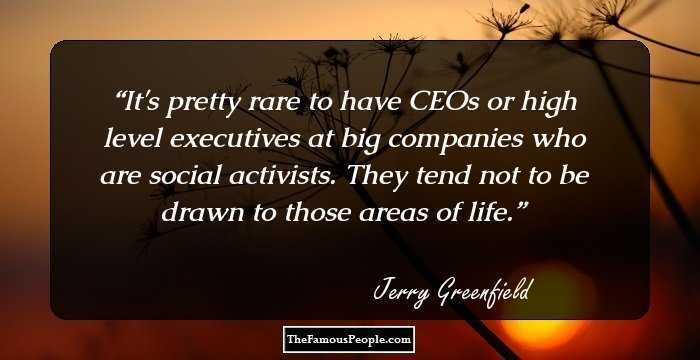 It's pretty rare to have CEOs or high level executives at big companies who are social activists. 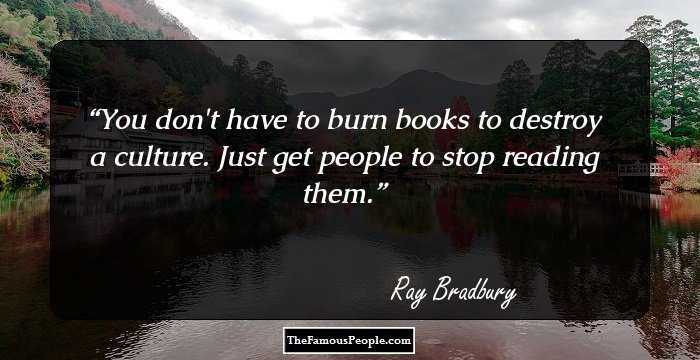 They tend not to be drawn to those areas of life. Startups are often very undercapitalised, but I found that to be very beneficial because it forces you not to throw money at problems. 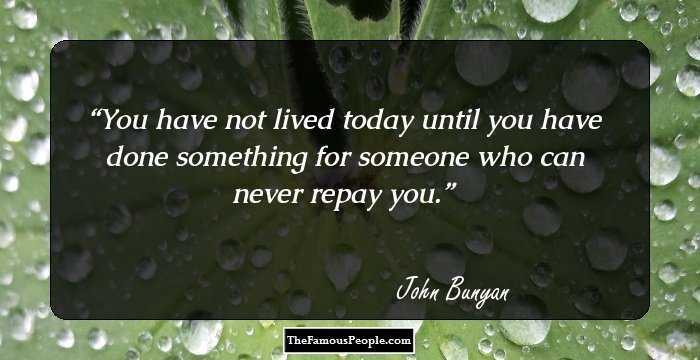 Instead, you learn all the nuts and bolts of what you're doing and become an expert. The reality is that most companies are not about any values at all - they are about making money. It is extremely rare for a business to stand for anything because most businesses don't want to alienate potential customers, and if you believe in anything you are going to alienate someone. You know, I get frustrated with our country's administration, which is really the people who are not acknowledging global warming. 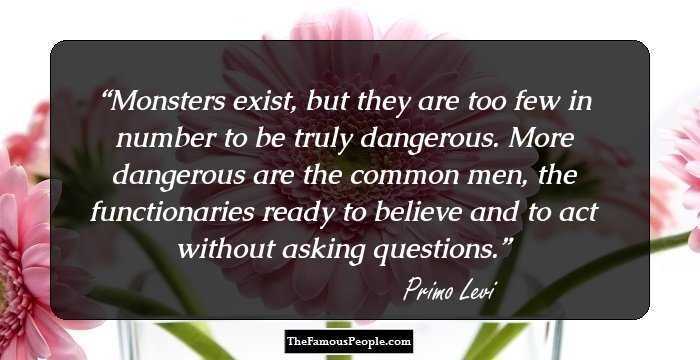 I mean, it's accepted by scientists around the world, scientists in our country and it's accepted by every country around the world with the exception of the United States.